(Phys.org)—Wolves and Yellowstone. In the public mind, and in nature, the two are inextricably linked. Now, it turns out, they aren't alone on the ecological dance floor. Elk and willows play a critical role in wolves' success in the Yellowstone ecosystem, willows serving as browse for elk—and elk as food for wolves. But there's another species involved, one that's instrumental to these well-choreographed steps: the beaver. "Beavers are the missing piece in this ecosystem," says ecologist Tom Hobbs of Colorado State University (CSU) in Fort Collins. The loss of wolves caused far-reaching changes in the Yellowstone ecosystem: more elk and fewer willows. With no willows to slow stream flow, creeks flowed faster and faster. Beavers prefer slow-moving waters, so they disappeared with the willows. "Putting wolves back isn't enough to reverse the extensive changes caused by their long absence," Hobbs and other scientists discovered in a decade-long research project. The ecologists published results of their study this week in the journal Proceedings of the Royal Society B. In addition to Hobbs, co-authors are Kristin Marshall, formerly of CSU and now of the National Oceanic and Atmospheric Administration, and David Cooper of CSU. Marshall is the paper's lead author. "This research illustrates the value of long-term ecological experiments to understanding how species interactions cascade through food webs to determine ecosystem resilience," says Alan Tessier, program director in the National Science Foundation (NSF)'s Division of Environmental Biology, which funded the research. "The results have immediate practical applications in restoring and protecting ecosystems such as that of Yellowstone." Scientists had thought that the return of the wolf, leading to a cutback on elk numbers and willow-browsing, was central to restoring the Yellowstone ecosystem. "But Yellowstone also needs beavers," says Hobbs. That's why bringing back wolves didn't work to quickly restore the ecosystem, the researchers believe. Wolves hunted elk and brought down numbers of these ungulates. But removing elk-browsing wasn't enough for the willows. They needed the sluggish streams created by beavers. But the beavers were gone. 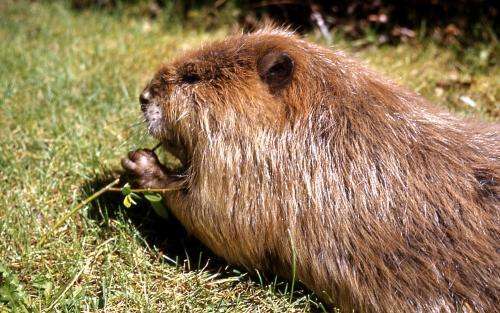 Once, beavers had been abundant anywhere streams flowed through Yellowstone. And that was almost everywhere. In the past, dams made by beavers were ubiquitous features of Yellowstone's stream network. A third of mainstream reaches show evidence of sediment deposition as a result of beaver dams, a process that's happened for millennia. That sediment offered willows a place to take root. In the spring of 1921, scientist Edward Warren of the Roosevelt Wild Life Forest Experiment Station in Syracuse, N. Y., conducted a study of beavers in Yellowstone. Warren found beavers and their ponds scattered throughout the park. Near the Elk Creek Bench Colony, for example, Warren spotted "a group of beaver ponds which present interesting features," he stated in a report published in the 1920s. "The water supply is a small brook originating from springs in a boggy tract of several acres. The brook flows through a flat depression in a ridge, and it is in the swampy, springy ground just below the woods that most of the ponds are located." It's a rare if not non-existent sight in Yellowstone today, especially on the park's northern range where Hobbs' team conducted its research. "Excessive browsing of willows [by elk after wolves were gone] was implicated in the disappearance of beavers from streams during the twentieth century," Marshall, Hobbs and Cooper write in their paper. "The loss of beaver ponds from the stream network...compressed the area of bare, moist substrate needed for willow establishment." Yellowstone ecosystem questions: answered by beavers? Restoring an ecologically complete ecosystem in Yellowstone requires the return of willows—and with them, beavers. There's a clear threshold for ecosystem recovery. Willow stands must be more than six feet tall, the scientists found. That height is important, says Marshall. Then willows are beyond the reach of browsing elk, and can serve as seed sources for new young willows. Once willows have returned, beavers will gnaw down a certain number of them to build dams. The dams will further slow stream flow, allowing yet more willows to grow. The results offer new insights on the role of wolf-driven trophic cascades in the Yellowstone ecosystem, says Hobbs. Trophic cascades like that in Yellowstone occur when predators—or the lack thereof—in an ecosystem change the abundance or alter traits of their prey, in turn affecting the next lower trophic level. "The reintroduction of wolves to Yellowstone has contributed to improvements in the park's ecology, but clearly that ecology is a complicated one," says Marshall. "The take-home message is that we have to be careful not to remove predators in the first place."